At ESE, I had a nice chat with Chris (actually, I had a lot of nice chats with a lot of nice people - it was quite a challenge to attend any of the sessions), who told me that he was looking into template engines. I leave it up to you to make any assumptions on why he's interested in template engines. I happen to know at least three template engines: Velocity (which I had the joy of using in my active days at AndroMDA.org), the template, erhm, ... mechanism being used in PDE (I once fixed a bug which had been caused by this engine) and - you might have guessed it - Xpand (which I am a committer on). So, I gave a short demo of Xtext and Xpand to show Chris how easy it is to create (model-aware) code generation templates. Xpand comes with a nice editor which makes template editing a joy - it features code highlighting, hyperlink navigation, model-awareness and other editor goodness. Instead of letting only Chris know how that works, here's a short guide on how to write your own Xpand template and use it in a wizard. To make the example more realistic, I chose to implement a wizard that creates an Ant build.xml file for a simple project (something which is missing in Eclipse, AFAIK). So, here we go. Create a new plug-in project named "de.peterfriese.antwizard"
Add a New File Wizard to the project. I used the Custom plug-in Wizard to get me started. 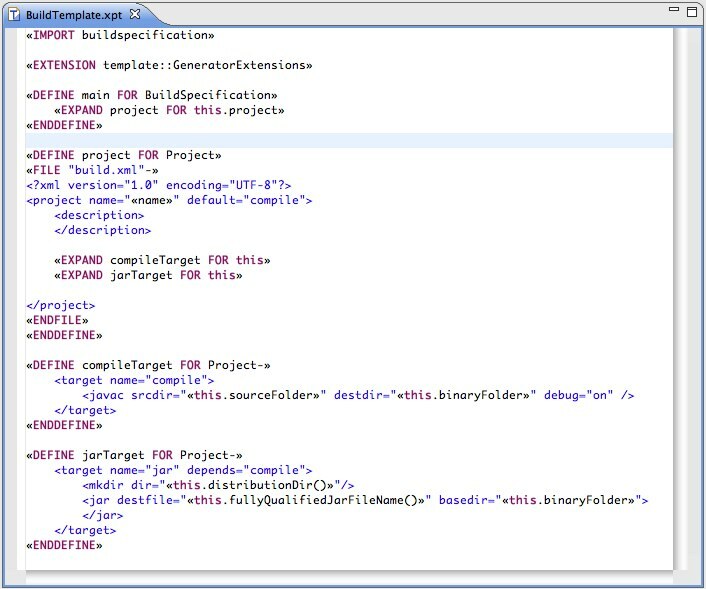 Brush up the wizard page and add some fields for project name, source folder and binary folder. We want to transfer the values entered in this wizard into our template, so we need to create an Ecore model that describes our data model. Add org.eclipse.emf and org.eclipse.emf.edit to the dependencies of you plug-in. Create a genmodel and let EMF generate the model code for you. In case you wonder how to get those funky characters: make sure us create this file using the Xpand editor - it has code assist (CTRL + space) for those characters. Add org.eclipse.xpand, org.eclipse.xtend and org.eclipse.xtend.typesystem.emf to the depencies of your plug-in. Create a new Java project in the runtime workspace. You can download the project here. Feedback and comments are welcome!